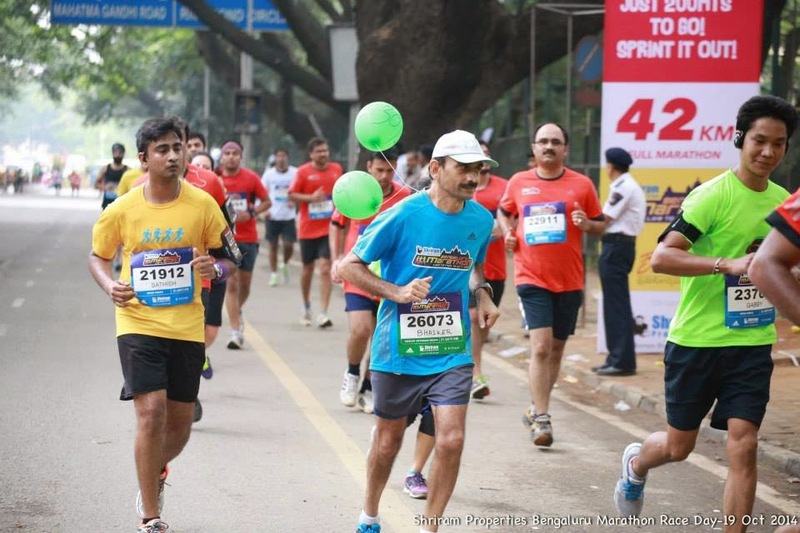 It was a fun and satisfying experience of being a 2:30 pacer at the Bengaluru marathon on 19th October. Signing up to be a pacer ensured that I did not run too fast as I had the responsibility of steering a bunch of runners to the finish line in just under the goal time of 2:30. And I managed a 2:27:41 finish(bib # 26073) - a minute or so faster than planned. 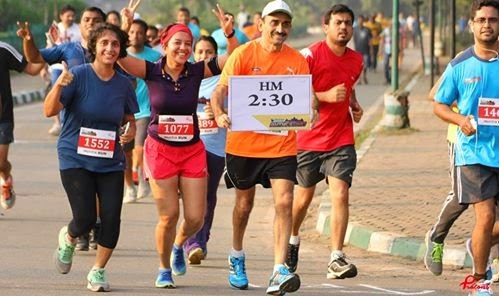 Met a bunch of runners targeting 2:30 at the Myntra sponsored promo run on 5th October. On that day about 10 of us ran 13.33 Km in Cubbon Park (photo above) in just under 1:34 at an average pace of 7:03/Km! 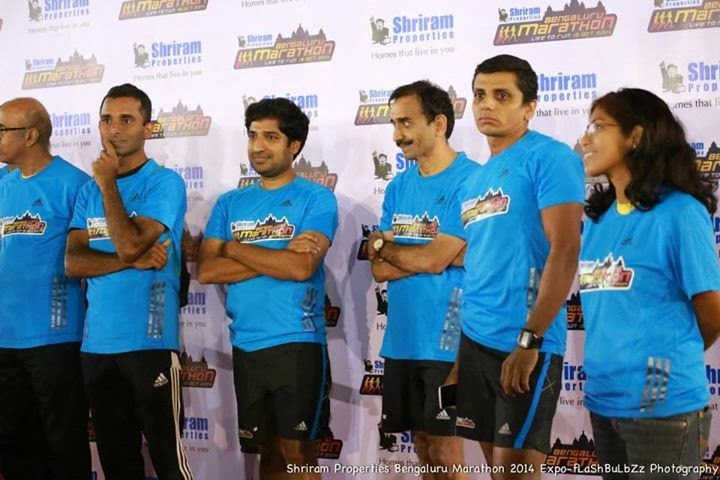 Also interacted with some of the runners at the expo in Kantterva stadium on 18th October. As my goal pace was a comfortable one for me the day before the race was fairly relaxing with no nerves or phantom aches and pains. Due to traffic closure on old airport road Rajesh Vetcha, Chandru, Ramakrishnan and myself left Ranka Heights at 4:50am on Sunday morning. As it turned out old airport road was still open for traffic. We parked in UB city around 5:20am, used the toilet there and were at Kanteerva by about 5:30am. After going in at 5:40 I collected my two pace balloons and pinned them to one corner of my bib. Met with a few of the runners targeting 2:30 in the holding area. At 5:55am the runners were let into the tracks to line up at the start line. At this point I transferred the balloons to my collar. This made them more visible and also it looked like this position would interfere less with my running form. At 6:05 am the 4000 + runners took off slowly exiting the tracks and then the stadium to enter Cubbon park from Hudson circle side. The uber cool weather and the ambiance of Cubbon resulted in a faster than target pace getting to 5Km in 33:16 at 6:39/Km pace. We loudly cheered every completed Km. I made conscious effort to slow down the average pace to 6:53 at the end of 10Km. Running around Ulsoor lake reminded me of the RFL fortnightly runs of 2005-06. Traffic was very dense and at times quite close to the runners in the Kensington road stretch of Ulsoor lake. It got worse at Trinity Circle where drivers and traffic cops were having a shouting match. It was great to be cheered on by Raji and Latha while heading from Trinity circle to Old Airport road. As we made the U turn at Domlur we were about 15 runners. The other 2:30 pacer was within a few meters of me - either ahead or behind. Between 15 and 17Km when we hit a slight gradient I lost a few of the runners as they fell behind. During this period we also hit traffic as both sides of old airport road was opened to it. For a brief stretch we found ourselves running in the middle of the road with a bus on one side and two wheelers to the other side of us. I hit the 17Km mark in just under 1 hrs 58 mins about a minute ahead of plan. At this point I asked the runners with me to push ahead based on the energy they had. Several of them pushed ahead. The traffic at Trinity circle had got worse- we were fortunate enough not to have been stopped to let the traffic go - which a some runners experienced much to their frustration. I tried my best to push and motivate the runners to keep a steady pace during the last 3Kms asking them to dig into their physical and mental reserves of strength. Did not see any marker after km 18. It would have helped runners if there had been markers counting down the distance to the finish line. I ran the last Km in about 6:31 to finish in just under 2:28. Several runners from my pace group finished in around 2:25 while a couple completed in 2:34. A large majority finished in around 2:27/2:28 and were extremely happy! There was no race clock at the finish line which was a bit disappointing. Overall it was a good experience to pace and run through the heart of the city . There were ample aid stations though there was crowding of runners around a few of them. The organisers made special arrangements for waste management and minimized the litter. After about a ten minute break I went back on the course to meet a few FM runners doing another 4.7Km for a total of 26Km per my Garmin. The breakfast arrangement was smooth and the food itself quite nice. With over 10K runners the race was a great success. Hopefully it will become an annual fixture and the organisers will do better next year in certain areas specially traffic control and management. I left the stadium around 10:15 and got back home by 11am.